Manchester City face Brighton in their 2017/18 English Premier League opening fixture and Coral Sportsbook is offering a massive price boost on the Citizens to win the match! Claim 25/1 Manchester City to beat Brighton + £5 free bet! Manchester City's pre-season has been promising. After a 2-0 defeat in the Manchester Derby, the Citizens hammered 4-1 Real Madrid, 3-0 Tottenham and 3-0 West Ham in their last outing. The Citizens go into the new season as the title favourites after an impressive summer transfer campaign! Fancy Manchester City to beat Brighton on Saturday's late kick-off? Claim a 25/1 price boost at Coral in few simple steps! Join Coral before the kick-off on Saturday (5.30pm) for 25/1 Manchester City to beat Brighton instead of the normal price!! Make your first deposit of £5 or more and your enhanced odds will appear on home page - 25/1 Manchester City to win vs Brighton! Coral are offering all BetAndSkill readers registering via our site a 25/1 boost on Manchester City to beat Brighton! Click here and claim this massive enhancement! 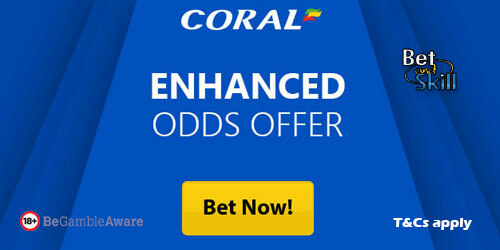 Offer available to UK & Republic of Ireland residents aged 18 years or over opening a new Online or Mobile Coral account in either £/€ currency through https://promotions.coral.co.uk/landing-pages/crazy-prices4, https://promotions.coral.co.uk/landing-pages/crazy-prices-online4 or the specific offer promotion box from coral.co.uk/sports/offers, between 08:00 BST Friday 11/08/2017 until 17:30 BST Saturday 12/08/2017 with the exception of new accounts depositing funds with Moneybookers, Paysafe, Neteller or Skrill. Place your FIRST real money bet as a win single £/€1 on ‘Man City to win 25/1'’ in our “My Markets” sections. Should your bet lose, you will receive £/€5 in free bets on settlement of the market. Free bet tokens will expire 4 days after issue. "Get 25/1 Man City to win vs Brighton at Coral + £5 free bet"